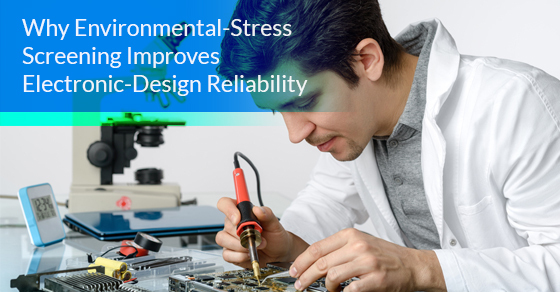 Environmental-stress screening (ESS) is the process used to expose a newly manufactured or repaired electronic product to the strains and traumas associated with environmental events like thermal cycling and vibration. ESS is done to bring to light any defects so that they can be corrected before the product goes to market. ESS plays a major role in circuit board design and helps improves the reliability of electronic design. How does ESS improve electronic-design reliability? Letting you know if spare parts will be needed: ESS allows you to determine if your product will require spare parts at some point during its lifecycle. Ideally, your product will not need extra parts to ensure its functionality and ESS testing will confirm this. Improving the quality: Let’s say your product does indeed need spare parts. Without ESS there would be no way to know this, and you can now use this information to improve the quality of the product so that spare parts aren’t necessary. Helping make decisions at all levels of the product’s manufacturing cycle: The product manufacturing cycle starts with circuit board design and terminates with its introduction into the marketplace. ESS gives you the opportunity to refine and restore elements of the product at every level so that you are guaranteed to have a superior product by the time the manufacturing cycle ends. Fewer failures at the warranty level: As part of the aforementioned manufacturing cycle, the warranty level is set before the product goes to market. With ESS testing you can determine what the warranty on the product should entail and set its duration period. ESS gives you an idea of how long the electronic product will last and can help determine what the repair costs of the item will be. Fewer failures at the field level: The more faults revealed during ESS, the more you can repair and correct before you send your product to market. Furthermore, it is always cheaper to repair a product after ESS than it is after it has already entered the market. With fault detection in place like ESS, you can ensure that your electronic product is ready for market all the way from circuit board design until the manufacturing process ends and a comprehensive warranty is in place. ESS predicts failures and leads to a better product that is built to last.